Hello everyone, I hope you are well. 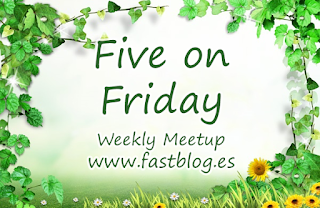 Today I'm joining with 'Five on Friday' with some random things happening in my home this week. I've found a pattern on-line for a washcloth which I'm crocheting for M. The aran weight yarn is actually a green colour as opposed to this nice turquoise colour shown in the photo. The pattern is simple enough - alternate stitches of dc and tr (uk terminology) incidentally the pattern is written in US terminology. I found when making this washcloth / dishcloth that I needed to go up a hook size for the chain. After the initial chain stitches, further rows of crochet disappointedly formed a rainbow shape. My crochet obviously gets looser as I progress. Last Sunday was Mother's Day and for anyone with a caring role within the home I hope you had a lovely day. In particular I thought about my 'little brother' over the weekend, who has brought up his (now) teenage daughter alone, since her toddler years. Nobody plans to find themselves abandoned and doing the job of both parents. I hope you know that you are appreciated and valued for who you are and not just for what you do. Some presents from the teens. A cookery book, a bottle with a message in it for me from teen 1 and breakfast in bed, porridge and orange juice from teen 2. Some good traditional recipes in here that I shall enjoy cooking. On Sunday we visited my parents to wish my Mum a Happy Mother's Day. I took the Daffodil card with some flowers and other goodies. The details of the card and pattern link to attic 24's design is here. My parents were having a bit of a clear out in their garden and they've passed on some patio dwellers. A wooden lady who needs re-strawing - her (straw) hair has all fallen out, bless her. She was a Christmas gift from us originally and now we have her back. The wooden figure was accompanied by a few plant pots of winter flowering Pansies, Pinks and a rather handsome frog. I baked some chocolate cake for film night, I made it gluten free so it's suitable for anyone. The original cake in this book is a round sponge sandwich topped with nuts. With melted chocolate in the recipe and a butter cream topping, it's very rich. I think these mini eggs from Aldi taste as good as the Cadbury ones. Maybe I need to buy a packet of each to do a proper taste test, lol. Below is the trailer for the film we saw. I'm listening to an audible book it's an enjoyable but slow story, flitting from past to present. If you're interested in book restoration, the enigma code and wartime lives this book will keep you entertained. Erica James explores relationships and this one doesn't disappoint. Saskia (a book restorer) has tragically lost both her Mother and Grandmothers. Now living with her Father and Grandfathers she discovers a notebook concealed within a bible. See here for an pdf extract. Did you enjoy Mother's Day last Sunday? Our Mother's Day is in May, I hope my kids are as good to me as your were. I'm reading "Light a Penny Candle" by Maeve Binchy. (Mother's Day falls on different days depending on the countries where it is celebrated. It is held on the second Sunday of May in many countries, such as Australia, Canada and the United States. It is held exactly three weeks before Easter Sunday in the United Kingdom. It sounds like you were thoroughly spoilt on Mother's Day. It's a bit different here now with just the two of us at home but I got phone calls from both children, cards and chocolates through the post. I can't resist Cadbury's Mini Eggs, I've got a packet in the cupboard which I'm going to add to chocolate nests ready for Daniel and Eleanor coming home next weekend. You're never too old for Easter nests, are you? Looks like you have had a wonderful and might I add yummy week. Happy Weekend! Glad you had such a nice Mother's Day! We have to wait a bit for it over here. I love that wooden lady for your patio, how fun! A taste test of chocolate Easter eggs sounds okay to me :) I just saw an April Fool's Prank over on Facebook to save the papers and wrap them around grapes, might be a fun joke for the teenagers. Hope you have a great week!